Heat oven to 400°F. In large bowl, stir Bisquick mix, milk and olives until soft dough forms. In 12-inch skillet, cook beef, onion and garlic over medium heat 8 to 10 minutes, stirring occasionally, until beef is thoroughly cooked; drain. Stir in tomatoes, corn and chili powder. Heat to boiling. Pour in ungreased 11x7-inch (2-quart) glass baking dish. Drop biscuit dough by tablespoonfuls over mixture. Bake 20 minutes. 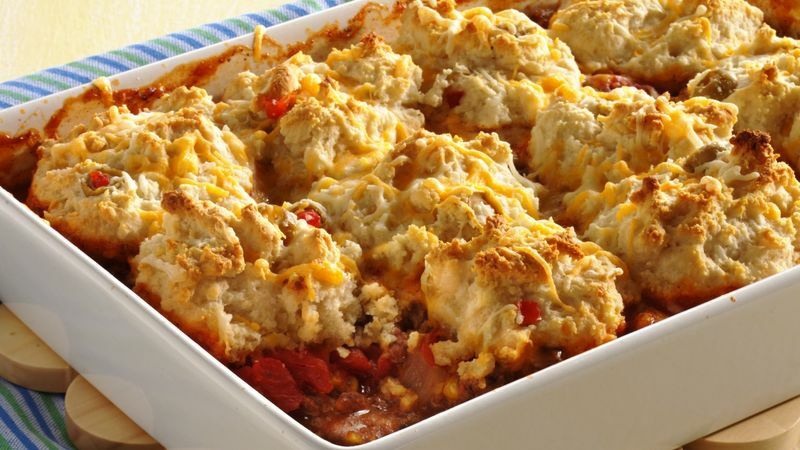 Sprinkle cheese over biscuits; bake 5 to 10 minutes longer or until biscuits are lightly browned and cheese is melted. If tomatoes with garlic and onion are not available, substitute a can of plain diced tomatoes and increase minced garlic to 2 teaspoons and chopped onion to 3/4 cup. Serve with a mixed-greens salad and, for dessert, rainbow sherbet topped with fresh fruit.